I like Traveller, both as a RPG system and as a milieu, and my own space opera campaigns have tended to be fairly heavily informed by my early experience of playing Traveller back in the early '80s. 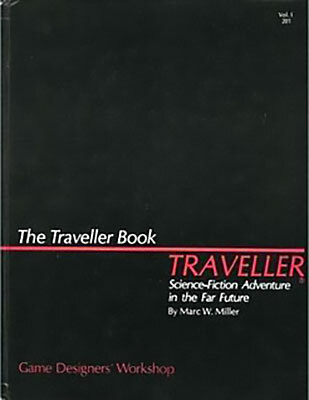 In those days, it came in a set of three small A5 soft-bound booklets, their covers basically the same simple black and red design as this one. 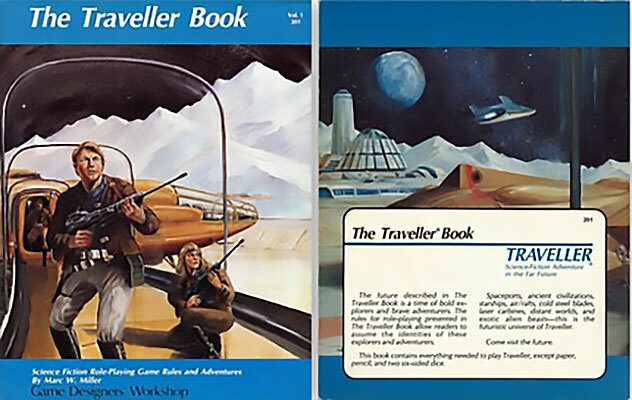 All three booklets were combined into a single hardback volume in 1982, and released as The Traveller Book. I'm not sure whether it was first released with the black cover, or the illustrated cover shown below. I have this version in PDF. In any case, the black cover is the one I just got through DriveThruRPG. It's a POD production, and the interior appears to be printed from simple scans of the original pages — it hasn't been re-typeset. As is often the case, that means that the content tends to look rather fuzzy. It's not illegible by any means, it's just not as crisp as the original. Maybe one day some enthusiast will do a new digital layout of the original content, but for now I'm happy just to have a hard copy of the rule book. It's been quite a while since I ran a sci-fi game. Maybe when my current AD&D arc is complete — whenever that might be — I'll swap over for a while.